Going through fertility treatment can be a stressful and emotional time. The HFEA (Human Fertility & Embryology Authority) constantly consult with their key audience to ensure they provide clear, useful information that is crucial to making a decision about where to have treatment. The HFEA site had been live for 3 years and was focussed around league tables that could often be misleading. The search functionality was not intuitive and as a result, their helpdesk staff spent a lot of time on the phone explaining clinic success rates to patients. For this reason, the HFEA conducted a public consultation to find out what worked best both for patients and clinic staff. The research showed the site needed to present different levels of information to cater to new and experienced patients. The HFEA chose Bunnyfoot due to the success of previous projects we had worked on together. We had also gained a valuable understanding of their sector and the sensitivities around their work, which was essential to grasping the complexity of the offering. The ideation workshop helped to develop an intuitive search that allowed users to refine and filter easily by treatments and location. We also developed the idea of a dashboard for each clinic that contained headline information with a way to drill down. 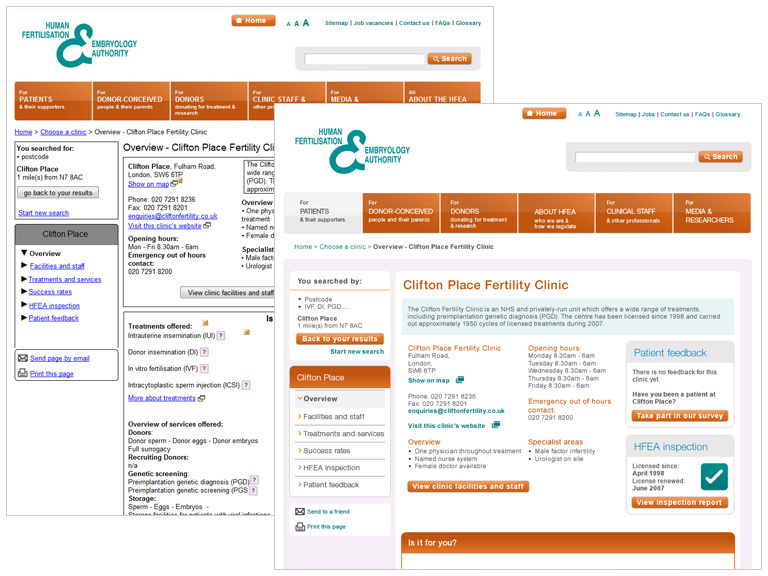 To help people to understand the success rates of the different clinics we devised a system of looking at statistics in three levels: ‘basic’ on the dashboard, ‘intermediate’ on the success rates page and a more detailed ‘take a closer look’ page. This supported the different levels of knowledge patients have when they come into the site. When tested with representative users, this model was a success with patients. We supported the HFEA through their design and development phase with on hand support from our ‘Rent-a-guru’ service. This flexible approach meant the team were not locked into particular days and could call for support whenever it was required. In the first year after launch, the site had a 100% increase in visits, a reduction in the number of phone calls to the switchboard and positive feedback from both patients and patient support groups. Bunnyfoot rapidly got to grips with the complexities of our success rate data. We were amazed by how quickly they took this information and developed a working prototype for testing. The results of the redesign have been outstanding with a 100% increase in visits!